This extremely quick and visual effect happens right in front of the spectator’s eyes and requires only the most simple of sleights to perform. The magician runs an elastic band around his fingers and starts a story about how easy it is to fool the eyes. Placing the elastic band around the first two fingers of his right hand he makes a fist and shows the band to his audience. On the count of three the magician opens his hand, the band jumps magically from surrounding the first two fingers to the last two. The secret to the Jumping Elastic Band is when the magician makes a fist; he wraps the band around all four of his fingers. A normal elastic band, preferably borrowed from a spectator, is all that is required. A little practice is all that is needed and the awareness that someone standing behind the magician can see the secret. The Jumping Elastic Band is as visually stunning as it is simple. This is one of those pub tricks that anyone can learn, which also means that if anyone sees what the magician does as he closes his fist, the game is up. 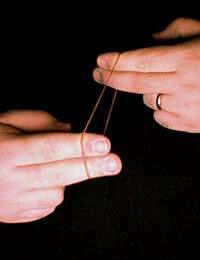 The elastic band jumps because it is wrapped around all four fingers, but the audience cannot see this. The band is wrapped around the lower part of the first two fingers, closest to the knuckles of the hand. As the fingers are closed the elastic band is stretched to accommodate the upper part of all four fingers, closest to the nails. When the fingers are straightened, the band automatically flips over and rings around the second group of fingers. If the magician had only put the band around both sides of the first group then when the fingers straightened the band would have popped right off. It tries to pop off, but because the second two fingers are in it as well it instead settles around them. Explain to your audience that you have a way to demonstrate how easily the eyes are fooled. This trick works best with an audience of one or two, making it a great quickie done in an office setting or a pub. Borrow an elastic band if you can, or produce one of your own. Make sure the spectator gets a chance to try it out, to make sure it is nothing more than what it seems. After a last pull, as the band is out, make a fist. Allow the band to close on all four fingers. Open your hand, and the band will jump magically from the first two fingers to the last two. It happens so fast there is no way the spectator will catch how the trick is done. Have another elastic band trick ready to go back to back with this one, and the Jumping Elastic Band will be more effective, establishing that something magical is going on.